After the Monster Energy NASCAR Cup Series race at Martinsville Speedway on Sunday, fourth-place finisher Ryan Blaney did the usual TV interview—saying he had the best car at times, but couldn’t get it across the line first. But it was hard to focus on Blaney, since fellow driver Daniel Suárez was getting stuff thrown at him in the background. 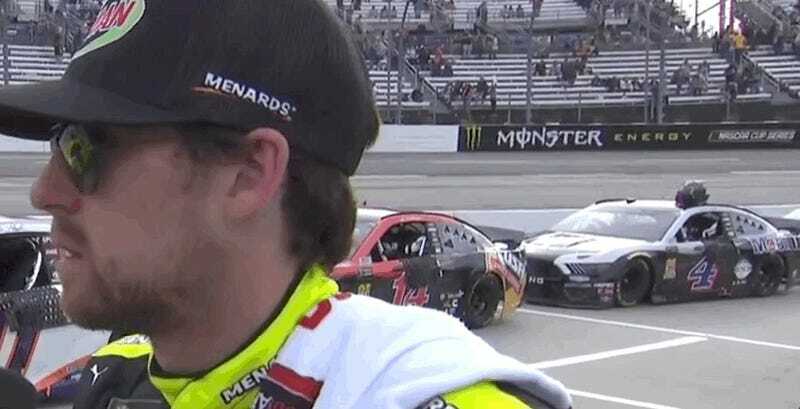 Suárez, who finished 10th at Martinsville after moving from Joe Gibbs Racing to Stewart-Haas Racing this year, was walking behind Blaney during the interview. It wasn’t clear what happened before or after Suárez got hit with what appears to be someone’s drink, since it occurred almost immediately after he walked into the frame and Fox Sports cut to race B-roll right afterward. The spokesperson said that type of behavior isn’t “encouraged or acceptable” at the track, and that Martinsville Speedway would look into ways to try to prevent it from happening in the future. Suárez’s race team didn’t have comment on the incident, but Jalopnik also reached out to NASCAR for more information and any comment on the situation. We’ll update this story if we hear back. Race winner Brad Keselowski was also the target of some drinks launched into the infield, with beer cans thrown at his car around the time he did a celebratory burnout. An industry veteran who was managing interviews with another driver nearby Suárez told Jalopnik that since things are so tight at the half-mile track, anyone in the stands with a decent arm at Martinsville can throw a beer or drink over the fence and onto pit road. That appeared to be what happened to Suárez and his PR rep as they walked toward the media bullpen at the end of pit road, the person said. The person called it a rare occurrence, even in their decades of NASCAR experience. Some, including Twitter users and the website Tireball Sports, say it sounds like someone yells “Mexican” right before Suárez is hit by the drink. The audio isn’t totally clear, but there are clips online and a replay of the Fox Sports broadcast if you’d like to hear it for yourself. The person who was near Suárez after the race told Jalopnik that while their focus was elsewhere, they didn’t hear anything other than race cars, drivers doing interviews, the PA and crews tearing down pit stalls around the time it happened. They didn’t hear anything derogatory, they said. But no matter what was or wasn’t said, if there’s one thing you shouldn’t do at a sporting event, it’s throw something at one of the people who just spent the past four hours or so out on a field, court or track for your entertainment. Or, you know, maybe just don’t throw stuff at anyone at all.